To inspire the next generation of innovation. 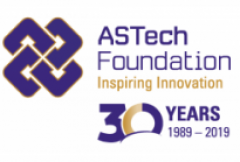 Celebrating 30 years in 2019, the Alberta Science and Technology Leadership (ASTech) Foundation is a not-for-profit organization founded through an industry initiative in 1989 to showcase the substantial achievements in science & technology in Alberta and to promote the importance of these activities to social and economic benefit. ASTech has grown with the support of Sustaining Member organizations spanning major industries – including agriculture, health, education, energy and technology – all of whom recognize and celebrate innovation and excellence in Alberta. To identify and celebrate outstanding achievements in science and technology in Alberta. We recognize, celebrate and grow the culture of innovation in Alberta year round through community outreach that highlights the work of our ASTech Awards alumni. The achievements and the passion behind the work are celebrated through Humans of Alberta Innovation and the Alumni Speaker’s Bureau. We support industry innovation and economic diversification through industry showcases that explore sector challenges from multi-stakeholder viewpoints. We encourage youth to pursue excellence in STEM through the NextGen Innovators Showcase and the ASTech Scholarship program. The ASTech Awards are Alberta’s most prestigious science and technology honours. The premiere event of its kind in Alberta, the ASTech Awards bring together 500 leaders from industry, government, media and educational institutions to honour and celebrate outstanding achievement in 10 categories covering the innovation ecosystem and sector-specific categories. The ASTech Awards recognize and celebrate our brightest minds and the greatest achievements of outstanding individuals and organizations in the Alberta science and technology community. Brenda Crickmore, (retired) Syncrude Canada Ltd.
Kevin Franco, Executive Advisor, Calgary Technologies Inc.
Jim Kresta, Analytical Lab & Shared Services Team Leader, Syncrude Research Centre, Syncrude Canada Ltd.